In the first part of this series, I described what "Toronto-style" sidewalks are and how they're supposed to work. In the second part, I detailed the rather technical history of how this sidewalk design, also known as "ramp-style vehicle access crossing", became standard, following through minutes from post-amalgamation City of Ottawa through to 2006. Feedback about the design started as soon as the sidewalks on Delaware (pictured above) and Holland Avenue were installed for the pilot project. Since then, the design has also received its share of criticism from various sources. Today I'll be discussing these criticisms, and other issues the standard has encountered. I'll finish the series next week with a review of alternatives, starting with how Ottawa's sidewalks have been designed through the ages. The windows were quickly boarded up. It looks from the outside like most of the fire damage was restricted to the upper floors. 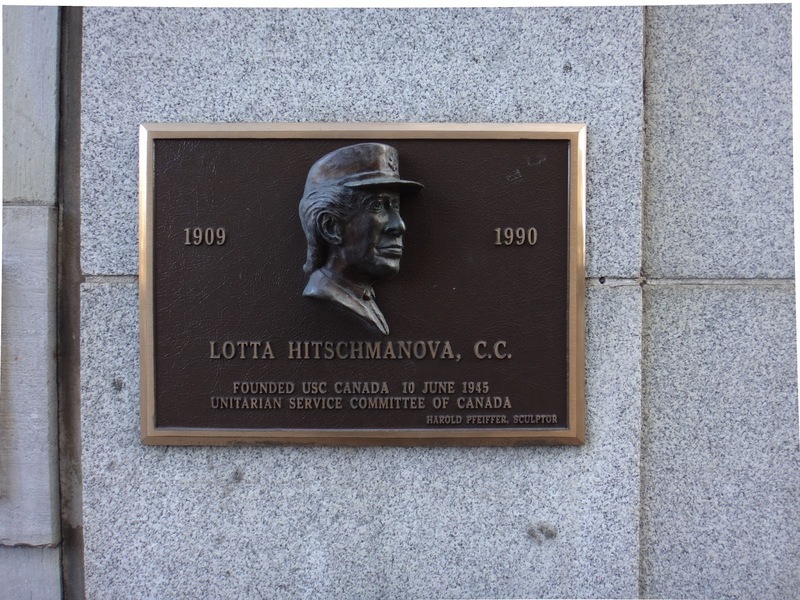 After picking up my mail from the Sparks Street post office last week, I noticed a plaque on the entrance to 56 Sparks which I hadn't before, with a relief profile of the subject, Lotta Hitschmanova. Not having noticed the plaque before, I also hadn't heard of her before either. Hitschmanova's Wikipedia Entry isn't too short, and longer than the entry for the Unitarian Service Committee of Canada, which she founded in 1945 and remains operating at 56 Sparks Street, suite 705 as USC Canada. 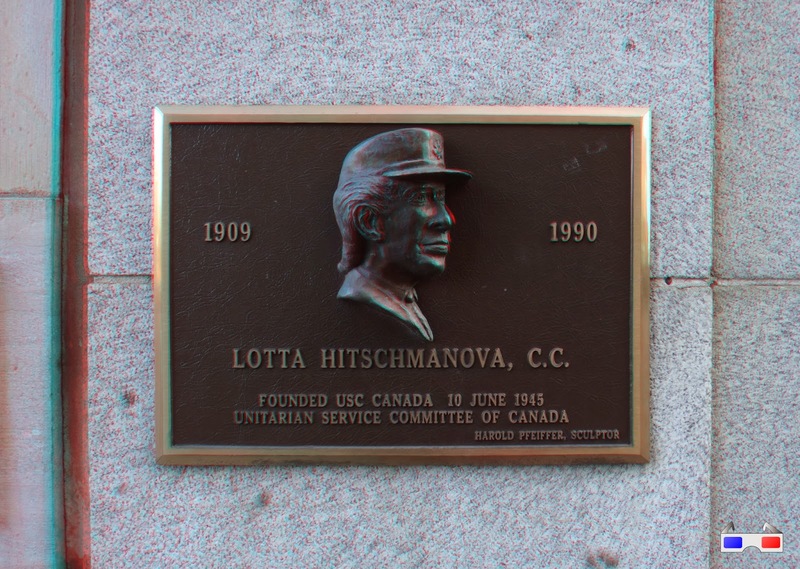 The USC Canada website has a trove of information about Dr. Lotta, including historic audio and video clips of USC public service announcements narrated by her. During warm/wet spells like the one we got a couple weekends ago, I bring a sidewalk scraper around with me to clear away some of the more persistent ice banks that were blocking drains around the neighbourhood. Oftentimes it only takes a minute or two to clear a small path and gravity does the rest, the water widening its channel as more of it passes through. It's important to have cleared away these puddles while it's warm so they don't turn into skating rinks on days like today, where it's minus 15 Celsius! On Cooper Street at Metcalfe there was a big one, stretching across the sidewalk and most of the way across the roadway. This one would be a challenge!! You can often find a catchbasin in the sidewalk which is blocked by some snow/ice, or at least the yellow "T" on the centreline of the road points to the nearest drain on the edge of the sidewalk. But this stretch of Cooper still has its rectangular grates in the road, and even if Cooper had the yellow Ts, the water was too deep to see them! Normally at this point I'd just call it in to 3-1-1 and let the City crews figure it out. I did that for a couple of spots on Florence where the ice banks were required too much effort to hack a channel through, and on Christie Street where an even bigger puddle than the one on Cooper wouldn't drain at all despite reaching the drains. In addition to heavy equipment, City crews have calcium chloride, a strong salt that they dump into the catchbasin, melting whatever snow is clogging the drain. This is the same stuff they spread on the roads, too. Being between two adjacent driveways, the sidewalk was dipped horribly down and therefore engulfed in water. It was in line with the fence that runs between the two laneways, which was a helpful landmark, but my feet would be completely underwater if I went in (I'd left my rainboots at home!). Luckily, leaning against the fence was a bedframe that someone was throwing out. After removing the casters, I was able to use this—very carefully—as a bit of a raft to give me drier footing to just barely reach the catchbasin. I chipped away at the submerged ice in the approximate location of the catchbasin until I heard and felt the distinct "plunk" that meant that I had reached the catchbasin! That is, I had cleared the ice off of one of the twelve little rectangles of the grate. I stepped back and tried to look for signs that the puddle was draining. Between the wind and passing cars, the floating surface ice seemed to be gyrating, but I wasn't sure if this was because it was draining, or just currents from the wind and passing cars (or, given the size of the puddle, tides!). But sure enough, the next day on my way to work, the puddle was gone! So the next mystery was, was it my intervention that did the trick? Well, looking at the scene, there wasn't any obvious signs of the City coming by to clear it with machinery. Presumably if a crew had come by, they would have waited until it was all drained, in which case they wouldn't have left it covered with snow and slush like it is. It's also possible that time and the warmish weather helped erode the ice blockage. Needing to satisfy my curiosity, I sent an e-mail to 3-1-1 asking if they had received any calls from anyone else. They replied a few days later to say that, no, they hadn't received any requests for that location, so the credit for clearing the pond was all mine! Over at the Kenniston Apartments, which is the name of the retail/apartment complex that contains the Lieutenant's Pump, there are three bike racks used primarily by the residents. I ride a bike in the winter—enthusiastically—but I understand that many people don't. If you're interested in trying, Citizens for Safe Cycling's annual winter family bike ride should be coming up sometime later this month. It's a great way to try with lots of company around, and hot chocolate with marshmallows at the end! Stay tuned to their website and Twitter for details. It's usually a Sunday late-morning in late January. I'll be limiting this week's entry to how we got to this design, which unfortunately requires a lot of text from City meeting minutes (ahem, back when they had text minutes you could search and skim instead of audio recordings you need to pore over and transcribe). You'll have to wait for next week for the well-illustrated post about criticisms and issues with Toronto-style sidewalks, which you won't have to read in the same blog post as this largely technical post. An interesting element of the story is that it starts in 2001, as the Transportation & Transit Committee for the first City Council for the newly-amalgamated City of Ottawa considered its very first budget (or in this case, reviewed the budget prepared by the Ottawa Transition Board). When the LeBreton Flats saw the arrival of the "road header" tunneling machine, its disembodied chewing tool seen here, an old Elm Tree played host. On Twitter yesterday I asked if I today's 3D photos should be of the Rideau Canal or of the World Exchange Centre theatres, the only vote was from the Rideau Canal Skateway account. This is notable because in previous years there were only accounts for Winterlude (which is now run by the Department of Canadian Heritage) and for the Rideau Canal waterway (which is run in the non-skateway season by Parks Canada). Now both the Rideau Canal skateway and the NCC itself both are on Twitter, and the Skateway account actively engages with the public. For quite some time now, I've wanted to do a thorough writeup on what in Ottawa traffic-geek circles is referred to a "Toronto-style" sidewalk design. People love them and hate them, for reasons that I'll discuss over the next three weekly pedestrian-themed "Peds on Weds" posts, starting here. "I talked to the project / concrete foreman on the site [Bronson west side, north of Gladstone]. I complimented him on keeping so much of the walkway level. He, however, was much more interested in pointing out how gentle the motorists’ slopes were, so there wouldn’t be much of bump for them." The Confederation building (1927) and Justice building (1935) on Wellington Street just west of Parliament Hill nicely frame the original Bank of Canada building (1937) on the south side of the street when you look south from Vittoria Street. On Monday, the Canadian Museum of History (i.e. the former Canadian Museum of Civilization) tweeted a photo of a wood carving, remarking at how large a carving it was, considering it was made from a single block of wood. I pointed out that there were no visual cues to give the viewer an idea of its scale, which is an important detail when you're discussing an object's size! That night, as I was searching for a quick subject to post for today's Peds on Weds post, I found this photo from this past March, of a metal plate embedded into the sidewalk with bumps on it, a.k.a. tactile paving for the visually impaired. It's outside the Centrepointe theatre at Ben Franlin Place (former Nepean city hall). I noticed two things about it: first, that the bumps were chopped off, presumably by snowplows, and second, that I didn't recall having seen them in Centretown. I presumed that the two observations were related. I took a photo, to file away in case it becomes relevant. 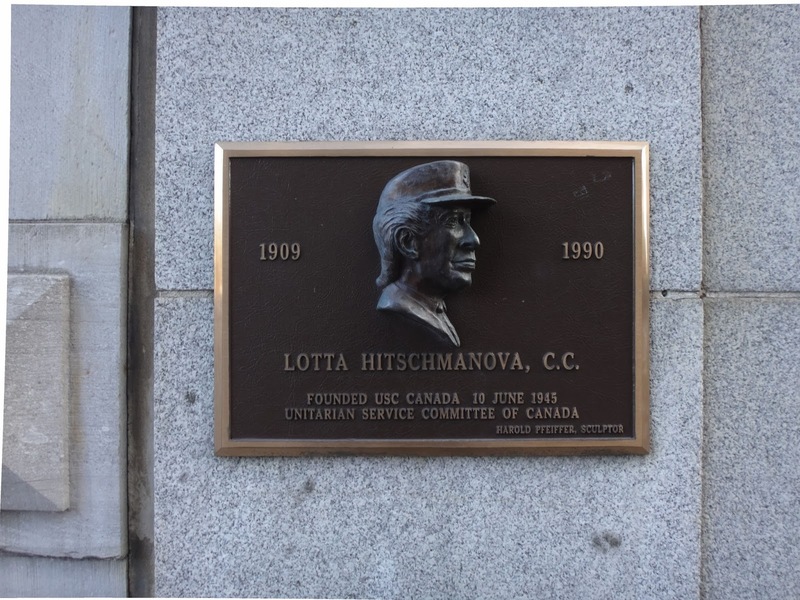 Fast forward to August, when I'm walking into Jack Purcell Recreation Centre off of Elgin Street at Lewis Street (technically on Jack Purcell Lane) and I saw one of these plates at the entrance. As is my habit, I took a photo of it. Unfortunately, when I went to put this into a blog post, I realized I had made a rookie mistake: I photographed the plate, but I didn't take a second photo that illustrates where the object actually is. There's no point describing a piece of infrastructure if you can't also describe where it is situated in relation to the building entrance and, in this case, the curb depression. This phenomenon is actually pretty common among people who aren't in the habit of photographing things as a hobby. I've on many occasions had people tell me about a curious road or sidewalk situation (such as a pothole) and they'd send along a photo of the object (and only the object), sometimes from many different angles, but all too close to get an idea of where the heck it is. And now I've done it to myself, too. Oops!